For his film project about "the first Polish officer in NATO", the renowned director begins shooting in January 2013 about Colonel Ryszard Kukliński, the Cold War Spy and communist whistleblower, a man who passed Warsaw Pact military secrets to U.S. intelligence for more than a decade. With Marcin Dorociński in the role of the legendary Ryszard Kukliński, the script to Jack Strong, written by director Pasikowski, is based on new material from the Polish Institute of National Remembrance archives, CIA operating documents and statements by eyewitnesses including David Forden, the former CIA operations officer who was the liaison with Colonel Kukliński. "Jack Strong is a thriller that deals with one of the world’s most fascinating spy stories," distributors Scorpio Studios have stated. Ryszard Kukliński was deputy director of the board of operating directors for the Polish Armed Forces general staff. He passed some 35,000 pages of secret documents to the CIA over the course of a decade, and warned the U.S. about the imposition of martial law in Poland in 1981, providing plans for that operation and other Warsaw Pact classified information. Shortly before martial law was imposed, Kukliński and his family were "evacuated" from Warsaw by the CIA and flown to safety in the U.S. His actions severely divided public opinion in Poland. A military court sentenced him to death in absentia in 1984; the sentence was later canceled, with a statement that Kukliński was acting under special circumstances. He died on the 11th of February 2004 in Tampa, Florida, and is buried in Powązki military cemetery in Warsaw, in the row of honour. "Jack Strong looks set to venture into controversial territory", asserts an article in Film New Europe. Now known for important contributions to the defense of the West during one of the Cold War’s most dangerous periods, supporters of the government headed by General Jaruzelski saw giving official secrets to the CIA as treason. "Kukliński is a tragic character, entangled in history" as Darius Fikus, the chief editor of the newspaper Rzeczpospolita, put it in 1995, "in which there are not and there will not be easy answers—at least for my generation." Dr. Zbigniew Brzezinski, the U.S. National Security Adviser under President Carter, was an early Kukliński’s supporter and ultimately his most effective champion for acquittal from the death sentence. He coined the phrase "the first Polish officer in NATO," which became the rallying cry for Kukliński’s exoneration. 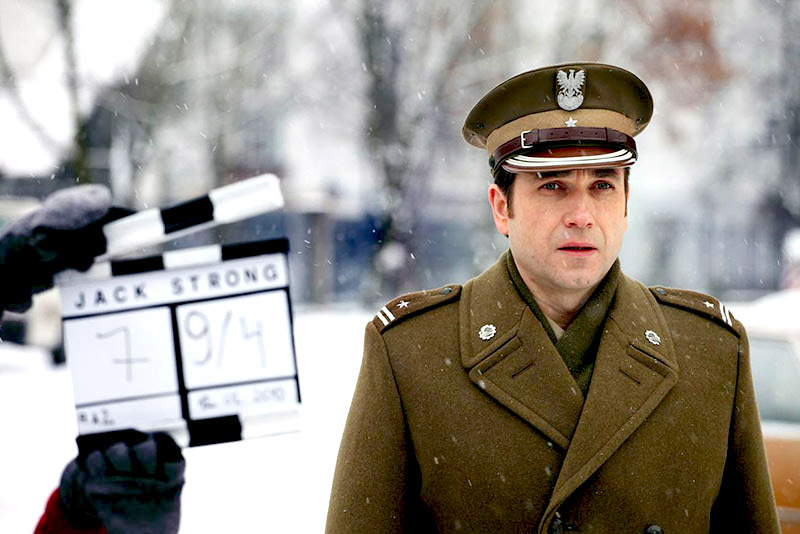 Pasikowski’s film project takes its title from Kukliński's CIA secret-agent pseudonym: Jack Strong. The cast will be announced in January 2013. The director of photography is Magdalena Górka, cinematographer on Pasikowski’s TV series Glina / Cop [editor’s translation], Mark Edwin Robinson’s The Levenger Tapes, Henry Joost and Ariel Schuman’s Paranormal Activity 3, and who also worked on Casey Affleck’s documentary Joaquin Phoenix. I’m Still Here. According to Bartosz Staszczyszyn in his piece for culture.pl, director Władysław Pasikowski is known as a creator of thrillers: "in his work he reaches for an impressive film form to deal with the difficult episodes of Polish history." He mixed cinema with historical issues in the 2012 film Pokłosie / Aftermath. The film addresses the events of July 1941 in the Polish village of Jedwabne, where during the German occupation of Poland, at least 340 Polish Jews were massacred by their Polish neighbors. In Psy / Dogs, he portrays Poland's difficult transition period at the end of the 1980s. Demony wojny wg Goi / War Demons According to Goi [editor’s translation] in 1998 shows the cruelty of the Balkan wars earlier that decade, smashing the stereotype of the good-natured Polish soldier. Jack Strong is the third feature film about Kukliński, joining Andrzej Trzos-Rastawiecki’s TV documentary Colonel Kukliński from 1997 and Dariusz Jabłoński’s Gry Wojenne / War Games. Those films portrayed him as a tragic character taking difficult decisions in the name of patriotism, and as a hero contributing to the downfall of communism in Poland.